There comes a time in life when you are ready to be different and what better way to show it than with your jewelry. Why buy a piece of jewelry anyone else can buy? Be creative and design you own. We are expert in developing your imaginations into beautiful jewelry you can wear. ....and no one can buy another one. Every item of jewelry you see is designed (we have the CAD file), printed and manufactured by us and can be customized to your desires. By having the CAD, we are able to change or rearrange any design to the way you want it. This makes it possible to change any style to use stones you may already have. Click on a style number, and request the metal, karat, size & stones you desire, and we will make it to your wishes. If you have an idea you would like to see, submit a picture, hand drawing, sketch or verbal description and we will develop it for you. Custom designed jewelry is very competitive in price to mass-produced jewelry and the quality much higher than the fashion brands produced overseas in sweatshops. It’s an established fact you feel and look better in custom tailored clothes and the same is true in jewelry. 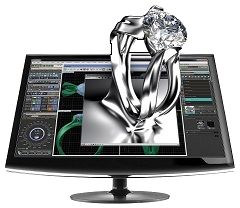 Let us be the custom artist for your jewelry desires.